We shared a sneak peek of this design earlier, but wanted to congratulate Tara & Adam on their recent wedding! 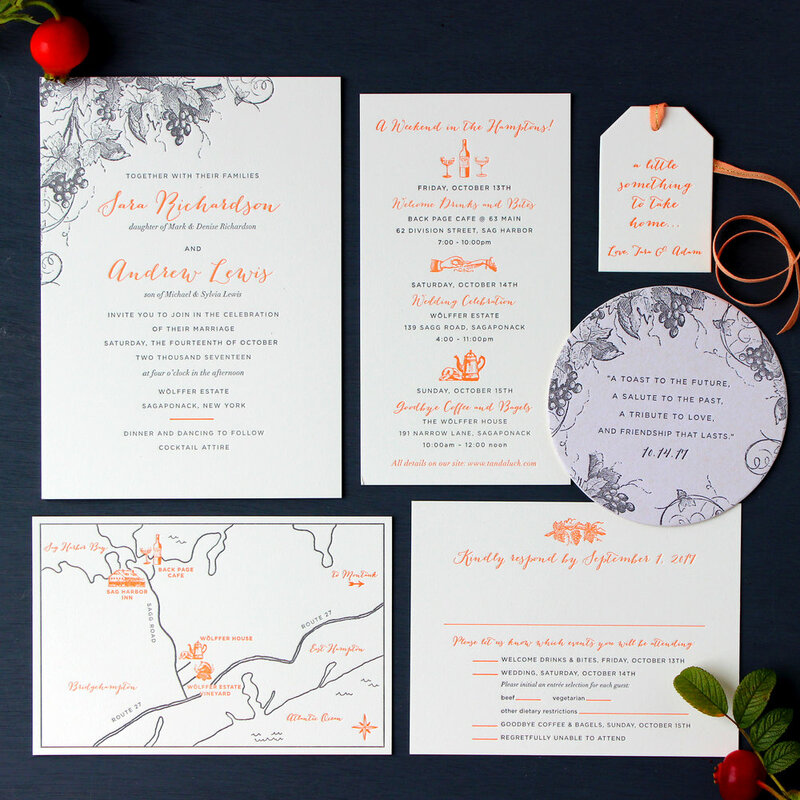 Here are some more detail shots of the beautiful invitation set for their Hamptons Vineyard nuptials. We love the illustrated grapevine, paired with a fun script for their names. This was such a fun project for us because we got to work on so many different pieces, like a custom map of the Hamptons, a fun itinerary card, favor tags, and even coasters! The custom map is a really sweet addition, highlighting the locations for the Welcome Drinks, Wedding and Sunday Brunch, as well as Sag Harbor Bay, Bridgehampton and East Hampton. We printed these cute little favor tags for the mini bottles of Wolffer Estate wine that the guests would receive. They were tied onto the bottles with this exquisite orange ribbon from Studio Carta. The letterpress coasters were also a customthat highlights the date, along with a memorable toast. These were such a nice treat to take home from the weekend!